Laser Engraving is a method that alters the surface of an object to create a certain look or desired design. Engraving can be done on various materials such as acrylic, wood, and glass. It works by the laser burning through the material to create the design. However, try not to confuse engraving with laser etching that is done by material deformation and is done frequently with metals. Although these terms are often used interchangeably, there are differences between laser etching and laser engraving. Each type of process has its own applications and attributes that make it ideal for different jobs. Laser engraving is a process where the laser beam physically removes the surface of the material to expose a cavity that reveals an image at eye level. • The laser creates high heat which causes the material to vaporize. • It’s a quick process caused with pulses. • Several passes are needed to create deeper designs. 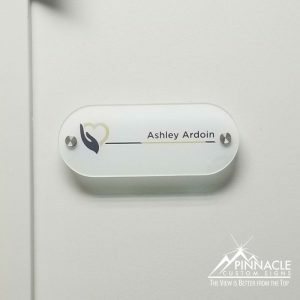 • There are three types of laser engraving which includes etching – the difference between them is what the surface is and how much you remove. • It is common for those who want something personalized or customized. • This is the fastest laser option. • Can endure high wear. • Used frequently to engrave serial numbers and logos. • Can be used on metal, plastic, wood, leather and glass. Laser etching, which is a form of engraving, occurs when the heat from the beam causes the surface of the material to melt. • High heat melts the surface of the material. • The material expands and causes a raised mark. • The depth in etching is no more than 0.001”. • Alteration of reflectivity and enhances contrast. • Removal 0.001″ or less of the material. • It can be done on ba metal surfaces, polymers and ceramics. • Engraving on a wide range of materials. Materials that can be etched or engraved. Plywood is a wood-based panel obtained by gluing of veneer layers. It is economical and durable. There are different grades of plywood that can be used in creating your signage or engraved item. If the signage is going outside we often defer to marine grade plywood to withstand the outdoor elements. Medium-density fiberboard (MDF) is a composite panel of wood fibers to medium density. It’s isotropic, economic and resistant. It rivals the affordability and versatility of plywood and similar engineered wood products. In certain situations, MDF even trumps all the others, because it’s so wonderfully easy to work with. Unlike real wood, MDF has no knots, grain, or warping, and its smooth surface gives way easily to the saw, leaving no splinters, burns, or tear-outs. For light carpentry projects, such as shelving and trim, MDF can be excellent. It is tough, lightweight and has an excellent light transmission that typically comes in clear format but can be done in different colors with thicknesses. The biggest advantage of Acrylics are the various thicknesses and mounting options that are available. Clear Acrylic works great when illumination or “see through” features are necessary for the final project. 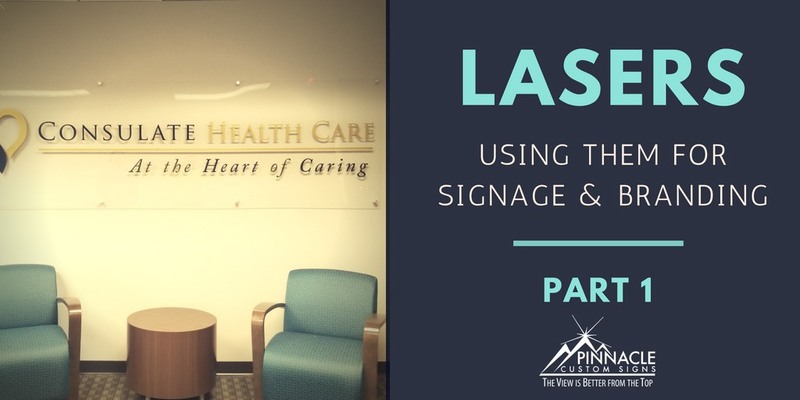 By utilizing laser’s in your signage and branding designs, our team can provide your business with a higher level of detail in your office signage. 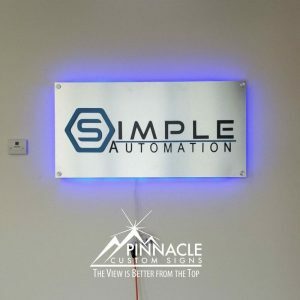 Lasers can be used in to create door signs, lobby directories, and lobby signs that provide a high level of illumination and create a touch of class in how they look. 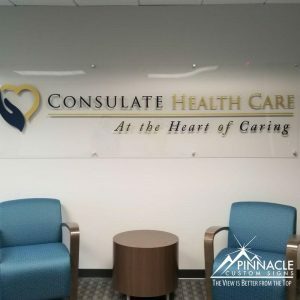 Pinnacle’s team can help you create more intricate designs with interchangeable aspects to up your game in how you display your brand across even the most basic spaces such as room numbers. 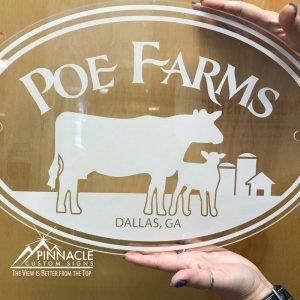 By using acrylic etched designs, it brings a new life to applications like illuminated displays and signs. Let us consult with your team on how to integrate this method into your overall signage strategy. Give us a call or send us a message today.